(Central Islip, N.Y., Sept. 30, 2016) - The Sugar Land Skeeters topped the Long Island Ducks 5-3 after a three-run rally in the seventh to take their first ever Atlantic League Championship title. Sean Gallagher managed seven innings with two earned runs and six strikeouts, while Derrick Loop earned his 33rd save of the season. Juan Martinez was named the 2016 MVP of the Skeeters. The Ducks would strike early, with Fehlandt Lentini stealing home and scoring from third base with Delta Cleary Jr. at bat. However, the Skeeters would respond in the top of the fourth with a double to left field from Lance Zawadzki, bringing Jeremy Barfield and Travis Scott across the plate to give the Skeeters a 2-1 lead going into the fifth. The Ducks would then tie things up in the bottom of the fifth after a double into center field would bring Lentini in from second to score. Cody Puckett would then single to third base, but a throwing error from third baseman Juan Martinez would allow Puckett to advance to second and Lew Ford to score, giving the Ducks a 3-2 lead going into the sixth. The Skeeters would continue to push, however, with a three-run rally in the seventh beginning with Martinez’s single to center field allowing Wilfredo Rodriguez to plate a run. Josh Prince’s single to center field would bring the Skeeters further ahead, plating Jeff Dominguez and Martinez. The Skeeters would go into the bottom of the seventh with a 5-3 lead over the Ducks. 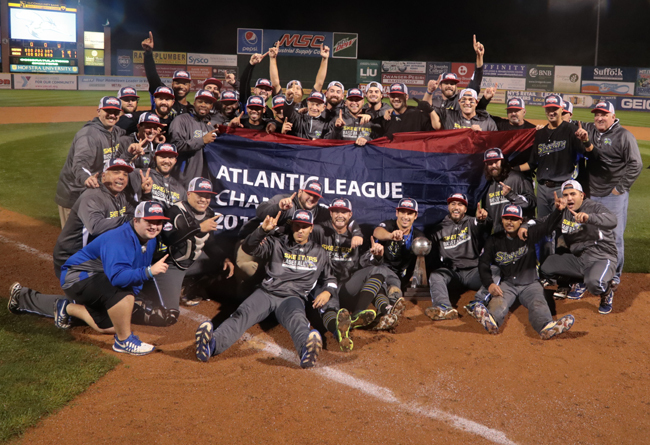 The Skeeters would successfully hold the Ducks to three runs, ultimately giving them a 5-3 victory and their first ever Atlantic League Championship title.